Nominated for mayor of Philadelphia, a progressive teaches a lesson about coalition politics. The billionaires who play politics with America make some of their biggest plays in some of our biggest cities. They identify candidates who share their penchant for “school choice” schemes, vouchers, and privatization—like Chicago Mayor Rahm Emanuel—and they pour money into slick TV ads that sometimes tip the balance of urban elections. Sometime, but not always. Bill de Blasio was elected mayor of New York in 2013 as a progressive, as were Marty Walsh in Boston and Betsy Hodges in Minneapolis. Newark Mayor Ras Baraka scored a breakthrough victory in 2014 as the candidate of a coalition of union activists and public-education advocates. Jesus “Chuy” Garcia forced a runoff against Emanuel in Chicago this year and took a solid 44 percent of the vote on April 7. Then, on Tuesday, the guy the Philadelphia Daily News called “Jimmy from the block” beat the big spenders to become the Democratic nominee for mayor of America’s fifth-largest city. “This election shows that a candidate propped up by big money can be beaten out by a candidate who stands for true progressive values,” explained Sipp. That’s right. But there is a little more to it. Kenney did not make a timely embrace of the big-tent progressive politics that is suddenly in vogue—at least among Democrats—as America struggles to focus on issues of racial and economic injustice, environmental crisis, wage stagnation, and income inequality. He practiced it, for decades. When unions went on strike, “Jimmy-from-the-block” showed up with his picket sign—telling folks about how he “washed dishes after school as a member of Local 274” and earned his first union card at 17. When concerns arose about racial and ethnic divisions, he showed up for community meetings and established alliances with African-America, Asian-American, and Latino activists. When he saw discrimination against gays and lesbians, he championed a groundbreaking LGBTQ Equality Bill. When kids were getting busted, facing the threat of criminal records and even jail time for minor offenses, he worked to decriminalize marijuana. When neighborhoods were getting socked by corporate polluters, he helped set up a City Council Environmental Committee to put clean air, clean water, and solar power on the agenda in City Hall. Kenney toyed with a mayoral bid. But it didn’t look likely even as the campaign was getting started. In January, as labor and community groups sought to identify a progressive alternative to Williams, they turned to Kenney. It was an audacious notion: that “Jimmy-from-the-block” might beat the political and economic power that was arrayed to seize City Hall. But he gave up his council seat and started running. As a labor- and community-backed, multi-racial coalition came together for Kenney, and as he began to surge in the polls, the billionaires doubled down. “One group, American Cities, raised $6.8 million as of May 4 to support state Sen. Anthony H. Williams for mayor, with 97 percent coming from three guys on the Main Line who founded a stock trading firm,” reported the Inquirer. But Jim Kenney still had those nurses and teachers and gay rights activists and environmental advocates and Councilwoman Tasco, and they were still knocking on doors—still arguing that cities should be on the side of workers and neighborhoods and civil rights and public education. When the votes were counted Tuesday night, that message—not the one in the ads paid for by the billionaires—prevailed. 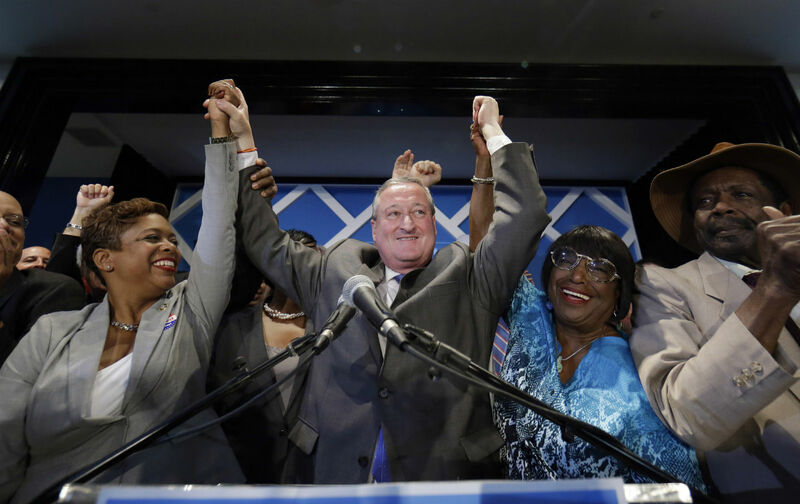 Jim Kenney won by a 2-1 margin over Williams, with four other candidates trailing far behind. Kenney took 58 percent of the overall vote and swept to victories in more than 50 of the city’s 66 wards. Up on the stage, Jim Kenney waved a clenched fist of solidarity to the cheering crowds and proceeded to thank the unions and the activists and elected officials, one by one, name after name, for sticking with him. They had proven something about politics, not just in Philadelphia but in America. Sometimes, great piles of money are not enough. Sometimes, great coalitions of people win out. Sometimes, “Jimmy from the block” beats the billionaires.